Keep on Rowland: Blood, Sweat and Tears. We have a little house progress and it is quite exciting. As much as I would like to pretend that there is a long list of subcontractors on call to come and fulfill each task, that is far from the truth. This house is already becoming filled with pure Rowland blood, sweat and tears. (Less blood and sweat on my end.) Can we say "sweat equity" people?! This is the bathroom (or what is left of it). Everything has been taken down to studs. The tub is next to go! 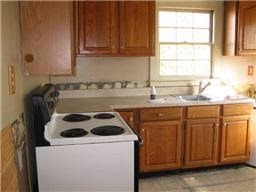 This is the kitchen with a big ole' nasty pile of drywall and insulation on the floor. This is all part of the beautiful maddness/chaos. The cabinets have been removed and are now patiently waiting in the dining room for a Craigslist suitor to come and claim their gem. This is the brick sidewalk that was buried underneath the grass. I actually personally dug this little charmer out myself. Now we just need some pansies growing on either side and Steve Martin singing a tune while hopping down the trail. A few days of progress have brought much excitement. More updates to come!